Renzulli Learning infuses creativity, critical thinking and problem solving into the learning environment through lessons and projects which are developed around thousands of curated Web-based activities. Resources are targeted to students’ personal interests, learning styles and expression styles. Students access authentic tasks that encourage higher level thinking along with goal-setting, perseverance, communication, and collaboration. Independence is fostered as students track progress and manage their own learning while mastering learning objectives. 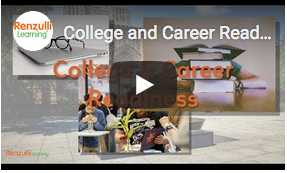 The knowledge and skills necessary for college and career readiness are integrated all along the way through alignment with Common Core, as well as many specific state, Standards. Administrators and teachers alike can track student progress and use data to inform instruction day to day, week to week, and year to year. Students can manage projects and create a personal portfolio of their academic work in Renzulli Learning. This portfolio can be shared with university admissions, officers, and potential employers. The Total Talent Portfolio travels with students throughout their educational career. It can serve as a reminder of previous activities and creative accomplishments that students might want to include in college applications. The portfolio records enrichment sites visited, favorite sites, and assessments of online Renzulli resources, projects and assignments that students have completed. The TTP also serves as an ongoing record that can help students, teachers, guidance counselors, and parents make decisions about future educational and vocational plans. The Renzulli Learning Personal Success Plan walks middle school and high school students through each step to define their interests, identify heroes and helpers, explore career options, set goals, make plans and develop projects. The personal success plan leverages the student’s Renzulli Profile results to align potential educational and career goals. Renzulli Learning has incorporated advanced high level courses offered through edX which originate from universities such as Harvard, MIT, Princeton, and 25 of the top 50 universities in the world. edX activities will offer high school and high achieving students courses within Renzulli Learning that will be aligned with their interests, learning and expression styles. Course disciplines include: computer science, engineering, business, data science, healthcare, psychology, writing, electronics, biology, business and more!